Nowadays, it’s easy to build a gaming PC thanks to the ease of putting together components. But choosing which hardware goes in your gaming rig is the tricky part. As we look into the features to consider when buying components, we want to guide you into fine-tuning your preferences. In the end, you will be looking at a uniquely made PC with carefully chosen hardware. Some of these parts are more expensive than others. You may have to save up or wait for deals before making a purchase. And if you have the cash, don’t wait up, you can start building your PC right away. The CPU is always the first thing you see listed when buying a PC whether pre-made or custom built. It is the brains of the computer and therefore determines how the system performs. Even if you need multi-threaded workload, you don’t need more than four cores for your CPU to work just fine. Well, unless you also need to use your PC as a workstation with animation and video editing software. Long run gaming requires getting the latest gen CPU from the very start. Overclocking increases core PC temperature and power needs. You will need to balance your needs from the beginning. If we were talking about building a gaming PC a decade ago, I would have told you to go with Intel and don’t look back. But AMD is no longer sleeping on its paws, and their CPUs are making a fuss just like Intel. The secret here is to balance features, performance, and budget. Intel is known for its high single-threaded performance where many games fall. But if you are not planning to use a high-end graphics card, you can get balanced performance from AMD’s Ryzen 5 series. Which Budget is Right for Gaming? At this price range, you can expect most CPUs to be in the AMD line up. They have considerable core counts as well unlocked multipliers and bundled coolers. Intel CPUs offer the choice to work with B and H series motherboards because they are not open to overclocking. This is where you want to pick your gaming CPU if you are on a budget but still get impeccable performance. Both Intel and AMD have competitive CPUs. With AMD, you will get overclocked models that are less expensive. Intel, on the other hand, offers both locked and unlocked multipliers. You can then pair your CPU with a pocket-friendly Z-series motherboard, or a high-end K-series motherboard. Upscale CPUs can pair with the highest ranking GPU cards to push graphics to the edge. AMD Ryzen 7 series fall in this category while Intel’s Kaby and Coffee Lake models are what you get at this price range. Getting an expensive CPU means pairing it with equally pricey components since some can’t work with just any platform. The Ryzen 2 line and Intel’s 9th gen are the latest CPU generations in these two brands. To identify them in a model number, you will find something like; Intel Core i9-9900K, Intel Core i7-9700K, for AMD; AMD Ryzen 7 2700X, AMD Ryzen 5 2400G, etc. The first digit represents the generation in the four-number cluster as in Intel Core i9-9900K and AMD Ryzen 7 2400G. For most gamers, you may feel like you want to stretch your processor for more performance. While this may keep a budget-sized CPU relevant for longer, it needs to pair with a motherboard that supports overclocking (which is more expensive) and an efficient cooling system. CPUs can have as many as 18 cores, but games are yet to catch up. That’s why you need to stick to at least four cores. Many modern games are made to run on high thread count and can take advantage of more cores. Earlier with single-threaded processors, the clock speed was the determining factor for performance. Enter multiple cores, and the clock speed becomes a little tricky to decipher. If you have the money, you will want to go for more cores and high clock speeds. But this is not usually possible when building a gaming CPU. You will need to do a tradeoff- go for more cores and slower clock speeds. This means; games that can take advantage of multi-threading will see improved performance. You will also see better system performance when running multiple applications like browsing and watching movies on Netflix when you have open games running in the background. For most games, you will want to look at CPUs with at least 3.0GHz with 4-8 cores. When a system is capable of using more than one core for processing, we call that multi-threading. Processors now support multi-threading which makes multi-tasking easier. Hyper-threading, on the other hand, is Intel’s proprietary technology where one core can split into two threads. If most games on your PC are optimized for multi-threading, hyper-threading makes the processing them even faster. When your CPU limits the full power of the GPU, we call it bottlenecking. Low-end CPUs will bottleneck high-end GPUs. As a rule of thumb, midrange CPU like i3/i5 and Ryzen 3 & 5 should be paired with midrange GPUs while high-end i7/i9 and Ryzen 7 should be paired with upscale GPUs. 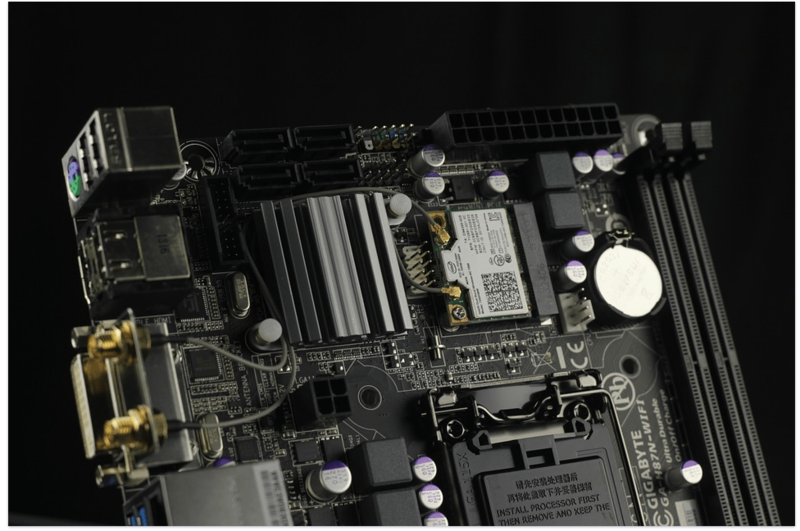 Every CPU has its distinct socket that must fit a specific socket size in the motherboard. You will need to ensure that your CPU is compatible with the motherboard. Intel does not support backward compatibility with its newer chips and motherboards. AMD, on the other hand, has their AM4 socket which can be used with 1st, 2nd, and 3rd gen Ryzen motherboards. This is the amount of power the CPU is expected to output. TDP is in watts like 90W. It is a number that allows you to help you identify the nominal value for which your cooling system should be built around. Still, on the topic of cooling, it’s important to understand that overheating can inhibit your PC from running a particular game or stop you from passing a certain level. It can also crash your gaming rig. Most CPUs come with a fan and sink combination. They offer excellent performance to price and require little to no maintenance. Some CPUs like Intel’s K-series do not come with a cooling system. You will have to look for an air cooler for them. The advantage with air coolers is that they fit in most CPU sockets. They are also the most reliable for systems that do not need extreme cooling needs. These are quiet, closed loop coolers that dissipate heat more efficiently than air coolers. PC gamers like AIO coolers as they are easy to install and satisfy gaming needs. Most of these are pump units that are installed on a copper plate. They circulate a cooling liquid from one tubing into a radiator which is then forced into the radiator’s fins. Cold air is forced into the liquid using static pressure fans. When the temperature of the liquid goes down, it leaves the radiator and is circulated back to the pump to cool the CPU. Pump units can be installed into small CPU spaces. But you will need to look at the size of the radiator because of the fins. Some have fans working on either side of the radiator and require more clearance. If the CPU is the brains, then the motherboard is the heart of your PC. It is where all the components connect. 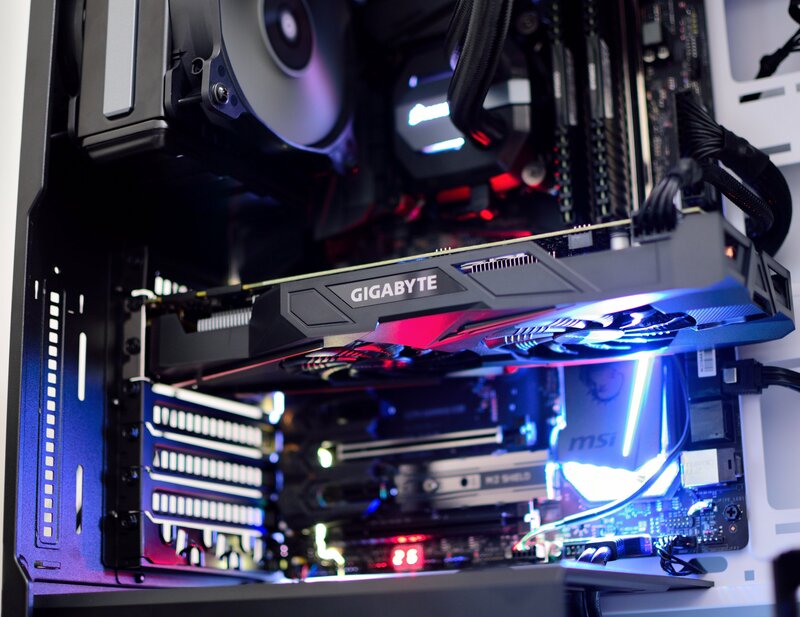 It relays information between the different parts and though not the most important in a gaming rig, you still need to look at some features to consider before buying your motherboard. ATX: It is the standard size and considered to have enough add-ons and slots with ample upgradeable options. Micro ATX (mATX): It is 2.4 inches smaller than the standard size and therefore has fewer slots, add-ons, and room for expansion. Mini ITX (mITX): This form factor is strictly for building small PCs. It has only one slot for a graphics card. You will also not have freedom with RAM and connectors. When choosing the form factor, know that ATX motherboards only fit in ATX cases, but mATX and mITX motherboards can fit in ATX cases. There are two ways to know whether your chipset option will support your CPU. First, you can research your chipsets on Wikipedia. The CPU you pick should be compatible with the motherboard’s socket. For example, high-end consumer AMD and Intel chips work only with X399 for AMD and X299 for Intel. For overclocking, you must choose from the K series chips. B300 and B350 chipsets are what you are looking at if you want overclocking capabilities with AMD. There are two types of RAM: DDR3 and DDR4. Your motherboard is compatible with one or the other. If you are buying DDR4 RAM, you have to install it on a DDR4 motherboard and viceversa. If your motherboard has only two slots, you need to fill it up with the highest amount of RAM say two sets of 8GB equaling 16GB. Even if it’s easier to upgrade RAM, you may not want to take up all the slots when you want to upgrade later. Your motherboard should support the specific speeds for your type of RAM. That said, if you are thinking of having RAM speeds of 3200Mhz, you should ensure to get a motherboard that supports 3200Mhz RAM. For gaming, you also need to look at the maximum memory that the motherboard can support, say 16GB or 32GB. From USB to HDMI, SD card readers, and audio ports, you will want to identify which and how many of these slots to have on a motherboard. HDMI (High Definition Media Interface): It is capable of transmitting high-bandwidth, high-quality streams of video and audio between devices. It is ideal for integrated graphics. USB 3.1 gen 1: With transfer rates of up to 5Gbps, you can use these ports to transfer files at incredible speeds. You’ll want more of this and less of USB 2.0. USB 2.0: It is slower than USB 3.1 gen 1 but is compatible with most devices and more so mice and keyboards. USB 3.1 gen 2: It has transfer speeds of up to 10Gbps and is now just starting to be adopted in gaming motherboards. USB Type C: It is a new standard for charging phones and transferring data. Its smaller connector shape is reversible making it easier to plug in. If you plan to upgrade later, you will want to check that the motherboard comes with room for expansion. The motherboard should have PCI and PCI-E slots. The PCI-E format is important since network cards, graphics cards, and sound cards usually come in PCI-E.
You don’t need to get a dedicated soundcard no matter how much of an audiophile you are. Modern motherboards have capable audio capabilities with no much difference with a sound card. For gamers too, unless you are connecting to the best gaming headset and want to maximize your audio capabilities, you can make do with the built-in audio of your motherboard. Lastly on motherboard features is networking; Wi-Fi and LAN. Every motherboard comes with LAN support but not all come with built-in wireless support. In this case, you will need to buy an add-on wireless adaptor. They come as PCI-E cards that will fit in the PCI-E slot on the motherboard. The graphics card determines gaming performance. From entry-level but effective Radeon cards to high-end Nvidia GeForce cards, you have every reason to give your GPU the highest priority. Get a high-end CPU if you are planning to get an expensive GPU. This way, you won’t bottleneck the GPU by using an outdated CPU. Don’t settle for less- Saving up to get a pricey GPU means gaming into the future on games that are graphically demanding. Bandwidth is critical than memory-GDDR5 memory offers twice bandwidth that of GDDR3 memory bandwidth at similar clock rates. Don’t get multiple cards for a single monitor resolution setup. Graphics performance increases up to 50% with two GPUs and decreases even further with more than two GPUs. That is; unless you have a triple 4K monitor configuration. If you are trying to push 4K at 60fps with games like Metro Exodus, you will have to ask for the best performance. This means getting a high-end GPU. But if you are dealing with 1080p as in the case with World of Warcraft, League of Legends, and Overwatch, you can make do with many user-accessible GPUs like AMD Radeon RX 580 and Nvidia GeForce GTX 1060. These are the two main GPU manufacturers. Nvidia is known for their high-powered GPUs thanks to the entry of their new line of GeForce GTX 20-series. They are the most expensive and can push 4K graphics at over 60fps. Nvidia has also introduced ray tracing a technology that supports realistic reflections and lighting. AMD is your go-to for budget-friendly cards though a bit less power-efficient than Nvidia. But still, AMD also comes with the latest technologies like AMD FreeSync equivalent to Nvidia’s’G-Sync anti-tearing technology. Here we go with the notion that you want to be more than just a casual gamer because if not, integrated graphics cards can do the job. These are low-end GPUs that can make your games fluid but will not run complex modern games. They include cards like AMD Radeon RX 560 and Nvidia GTX 1050 and GTX 1050Ti. These are midrange GPUs. They offer leaps in performance since they can run games at high resolution and high settings. For example, AMD Radeon 580 and Nvidia GTX 1070. You are looking at high-end GPUs that run modern games in 4K and can run Virtual Reality as well as emerging gaming technologies. Such cards include the likes of AMD Radeon RX Vega 56, Nvidia GeForce RTX 2080, Nvidia Titan XP, and super monster cards like Nvidia Titan V and Nvidia GeForce RTX 2080 Ti. Graphics cards also have onboard memory to store and process data. Full HD gaming (1080p) needs at least 2GB and up to 4GB while 4K gaming requires at least 6-8GB. Know that more memory does not mean better performance. If say you are running 1440p games with Nvidia GTX 1060 3GB and then you decide to get Nvidia GTX 1060 6GB the performance increase is a mere 15%. Like we said, the higher the pixels and refresh rates that a GPU needs to push, the harder it has to work. A 4K monitor requires a high-end GPU, unlike a 1080 monitor. Consider whether you will want to upgrade your monitor in the future. If that’s the case, you need to invest in an expensive GPU now rather than later. The GPU must also work together with the other components of your gaming PC. It has to be the correct size in height, width, and length to fit in the case clearance for graphics cards. 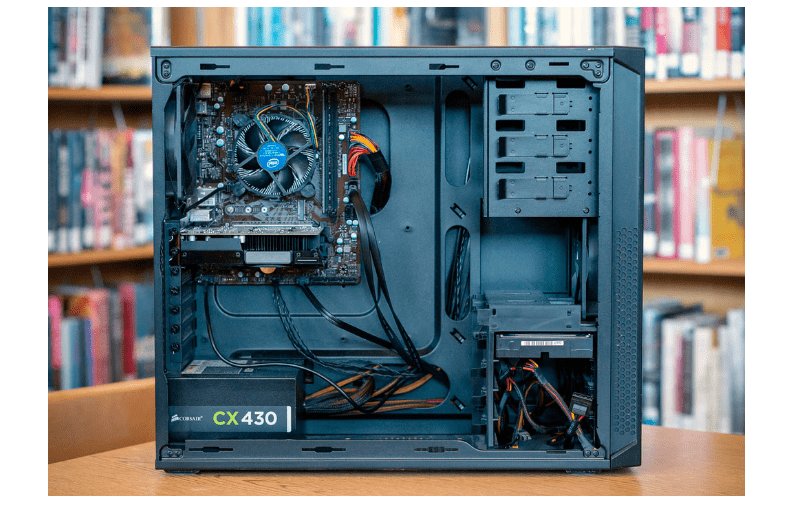 Compatibility is usually a problem if you have chosen to build a small PC as in the case with mini ATX and micro ATX cases. In this case, you will need to look at more than just the size of the graphics card. You need to know the exact clearance you have especially if you have already installed other components like the CPU which may take up more space than intended. Your power supply should handle the power requirements for your graphics card. Watts/TDP rating is not enough when checking the Power Supply Unit compatibility. You need to know the minimum +12v rail rating for the graphics card. Then, pair your graphics card with a power supply that has a higher rating than its +12v rail rating. This is the correct way of identifying whether you are getting the typical power requirements for a specific GPU. Both the GPU PCIe and power supply’s PCIe connectors must be the same. It means you cannot use a 6-pin connection with a GPU that requires two 8-pin connections. Luckily, all the information is usually listed on the graphics card and power supply spec sheet. Do you need an Overclocked GPU? Graphics cards can be overclocked (OC) or SuperClocked (SC). These cards offer a slight boost in performance over the clock speeds offered by GPU cards in the same class. But they are more expensive than regular cards just for the added performance. 95% of gamers do not need an overclocked GPU. A graphics card needs to connect to one or multiple displays. Most GPUs will connect over HDMI, DVI, DisplayPort, or VGA. Bottom line- Ensure that the graphics card you choose supports the connections you need to plug into your gaming PC. Say you are connecting to a dual-monitor setup and one monitor has HDMI while the other has DVI it is important that the GPU supports both types of connections. Do you need support for Virtual Reality (VR)? If you want your GPU to be ready for VR, it has to support high refresh rates. Most VR games start at 90fps gaming at 4K. The GPU should support at least 90 fps. You do not want to experience any screen tearing when moving your head as it causes nausea and headaches. Go for at least Nvidia GeForce GTX 1060 and nothing less. Are you Ready for Real-Time Ray Tracing and AI? Nvidia continues to push gaming into the next level with the introduction of ray-tracing in the latest GPUs. Simply said, ray-tracing aims at bringing lifelike simulations and introducing artificial intelligence on to desktop graphics. Since these are high-powered GPUs, they are not the best idea when you are starting to build your gaming PC. Besides, these cards are over $1000 and not viable options for beginners. Desktop memory is super easy to replace, install, or upgrade. RAM (Random Access Memory) is what the computer uses to store the currently running programs. How much you need is determined by the game you are playing and the numbers of applications running in the background. If your gaming system has enough memory to run your games, adding RAM is not going to affect gaming performance. If you are building a new PC, we suggest buying the newest module like 1.2V DDR4-2133 modules that has CAS 15 timings for Intel Skylake and X99 platforms. It comes with 4GB and 8GB sticks and is also pocket-friendly. But if you are upgrading a DDR3 system, you have no choice but to stick to DDR3 modules. Note that, Ryzen processors do not support DDR3 memory. On a budget, 4GB will run less demanding games and is ideal for older games. But if you are all about the latest entries in the gaming scene, at least 8GB of memory is required. If you have empty DIMM slots on the motherboard, all you need is to add another stick to upgrade to more memory. For high-end gaming, 16GB is what you want and not more. It can handle the latest titles and also give you multitasking capabilities. 32GB memory does not have any benefit in gaming over 16GB. It is expensive costing over $200, but the latest titles like Assassin’s Creed Origins use up to 12GB. Unless you are waiting on the future, it is better to stick to 16GB and below. You just have to select memory with the fastest speed you can afford. Speed does not matter for gaming except when using an AMD Ryzen CPU. Faster memory affects gaming with Ryzen. Always ensure that your system supports the speed you choose. There are a few things to consider before choosing RAM. Like I put it, older generation DDR3 RAM will not work on motherboards that support DDR4 RAM and vice versa. Small PCs with mini ATX and micro ATX have a limited number of memory stick slots. Remember to check this out before buying memory sticks that your motherboard cannot hold. Some air coolers can interfere with RAM. This is especially true if you choose massive CPU coolers and RAM sticks have tall heat spreaders. The heat spreaders may prevent the memory stick from being installed alongside the air cooler. Some motherboards come with one slot for memory while others have two channels. If yours has two, it is better to use one slot with the highest memory you can afford, say 8GB instead of using both channels with 2x 4GB sticks. As such, you will have one free slot that gives you the freedom to upgrade with more memory later. 1080p and 4K games can quickly fill up any hard drive. Coupled with media files and documents, you are looking at installing large capacity hard drives. 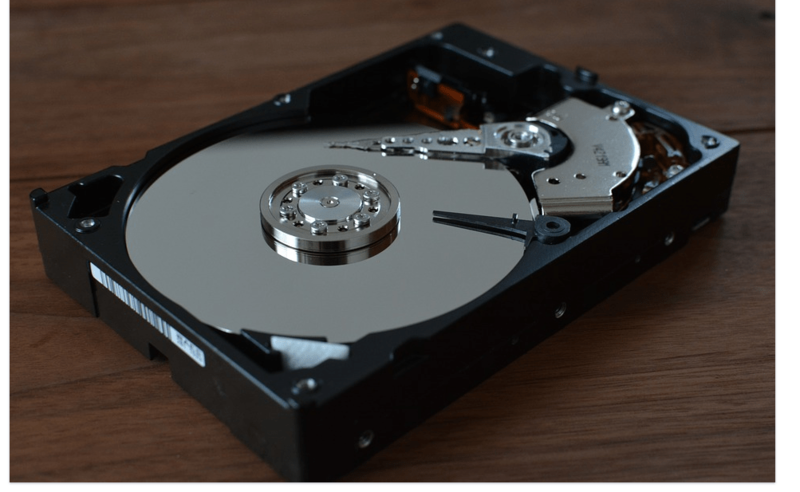 Solid State Drives (SSD) are faster but more expensive than Hard Disk Drive (HDD). A combination of the two is better than having only one. SSD support hyper-fast gaming loading times, while HDD offers the storage capacity, you need for games. Modern SSD protocol is either SATA or NVME (Non-Volatile Memory Express). SATA is an old protocol while NVME is a newer storage protocol and a host controller that accelerates data transfer over fast Peripheral Component Interconnect Express lane. NVME allows your machine to boot up faster, load games faster, and perform every other mundane task in an instant. For NVME SSDs, you need to ensure that your motherboard has the slot and support for such a card. The best combinations of SSD and HDD include having low-capacity SSD say 500GB, and high capacity HDD say 1TB. Your gaming PC will need enough power to drive all the components. The PSU draws power from the wall and gives it to the different parts from the GPU to the CPU, RAM, etc. Looking at a power supply unit, you will find that it has a wattage rating. The way it works with your computer may surprise you since there are different ways in which manufacturers get to their wattage rating. Your power supply unit is determined by the number of drives you have, your GPU, CPU, and whether or not you are overclocking. If you don't have an idea, start at EVGA power meter. It gives you an idea though they generally want you to purchase their power supply units. Power supply units come with an 80 plus number followed by the name of a precious metal. 80 plus indicates that a PSU does not waste energy. This means if your computer pulls 100 watts, the PSU will not draw anything above 100 watts say 120W or 150. But generic PSUs can easily pull above the required specifications of a system. When building a gaming PC, you need at least 500W/600W on a Bronze PSU. Choose from a reputable brand. It gives you 3-5 years of warranty and saves five watts for every 100 watts consumed. 600W PSUs can drive high-end graphics cards and have better cable management and cable quality. It gives you peace of mind since your system will never go above 400 watts. If you plan on adding a graphics card, then you should opt for a 750watts unit. First, never go for a non-modular PSU. Semi-modular PSUs come with a 24-pin ATX power cable for the motherboard. It also offers ports for other wires. Both semi and fully modular units provide a form of cable management, but a fully modular power supply can completely hide cables. As such, they can get the lowest possible temperatures because there are no wires to mess around. With new modular plugs, semi and fully modular PSUs are easy to install and replace. But fully modular power supply units are large and are too expensive. Most computer builders will like to use a semi-modular unit over a fully modular unit. Windows, Linux, or Mac OS? Windows is the best operating system for gaming thanks to its extensive selection of games as well as high performance is experienced for most games. Windows has been around for decades with over 84% market share. It is an incredible operating system and therefore the obvious choice for many. But with macOS and Linux showing competitive influence on professional users, can this OS stand the gaming test? Windows offers the widest compatibility with existing hardware and software. It is an evolving system that gives you new tools and versions at no additional cost. As much as Windows OS is the best for PC gaming, it is essential to understand that most malware is written for Windows. As such, you should install proper antivirus even if Windows 10 already comes with Windows Defender. The most popular PC operating systems from Linux are Ubuntu, Debian, Open SUSE, CentOS, Fedora, Arch Linux, and many others. 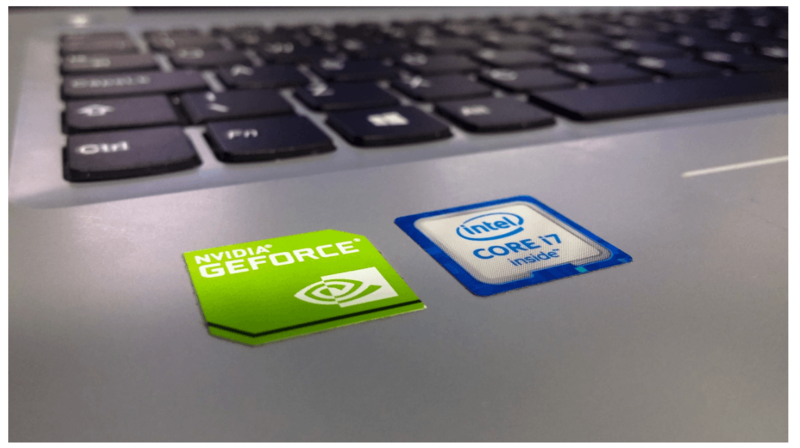 When it comes to gaming performance, it is similar to Windows with a slight difference in frame rates. Well, you can’t really install macOS on your PC unless you are building a Hackintosh. It has limited hardware compatibilities and is therefore not viable for PC gaming. An optical drive used to be the only way to get software to a PC. But with USB connections and broadband internet, it is now pretty easy to install anything including Windows. To access disk-based games, you still need to invest in a good optical drive that can play CDs, DVDs, and Blue-Ray discs. Optical drives are not a must-have item when building a gaming PC. You can easily get games on Steam. The PC case is just as important since it also determines what kind of CPU and GPU you get. This is because all interactions of the different components happen inside the case. Ultimately, you want to choose a case that is the right size to fit all your hardware and USB devices. With design advancements, PC cases are no longer plain as you can expect to find unique features like tempered glass, RGB lighting, lower temperatures, etc. The motherboard size, power supply, and in power supply position influence the size of a case. As you will find, mini-ITX and micro-ATX have little room for expansion and are not ideal for building a gaming PC. ATX is the standard size and can hold powerful hardware more so for gaming. EATX and XL-ATX are monstrous and are suitable when building high-end gaming systems. 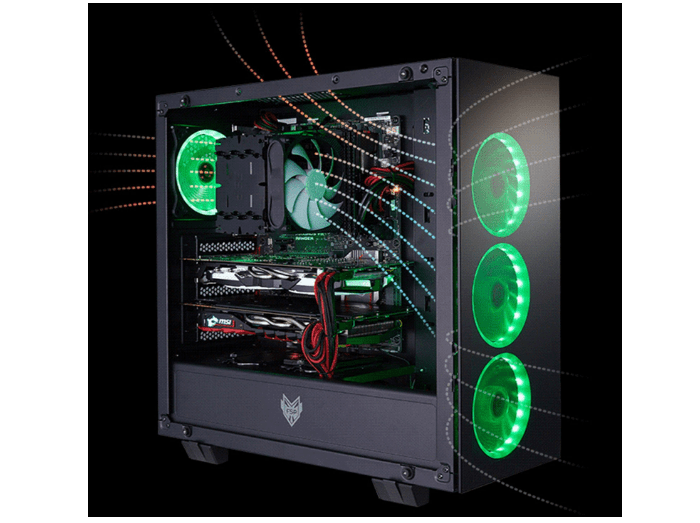 With the large towers, you have space for holding more than one GPU, and it is easy to modify the configuration. Most issues arise with air cooler height, liquid cooling radiator size, and graphics card length. Most expensive GPUs are longer than regular, affordable GPUs. Medium tower and large case sizes are recommended for such GPUs. You will need to look at the exact specifications for the GPU and the clearance that you need before deciding to choose a certain case. You also need to look at the size specifications for air CPU coolers as some have taller heatsinks than others. Not to mention the liquid cooler radiator size since they also come in a variety of sizes. If you choose to go with a custom build cooling setup, you may need to go for the largest form factor that offers lots of space to accommodate reservoirs. If you want to have a clean system, then you will want to consider a case that offers cable management. This way, you can have all your cables guided efficiently. It is more important to have cable management if you are building a gaming PC for the first time. Color coordinated cables make it easy to identify and focus since there can be too many keep up. You wouldn’t want your PC case to scratch or worse bend easily barely months after completing the setup. It is important to look at the build quality of your PC case. Don’t go for thin shells on cheap cases. You may have to look hard, but it’s possible to get a sturdy case on a budget. The best graphics card is not enough without a good enough monitor to display the graphics. With the wide variety of monitor sizes and features, it can be difficult narrowing down to just one. Although a personal preference, a big screen size brings everything to life in a better way than small screen sizes. If you have the room to get a curved 34-inch screen, go for it. But for most gamers, you should experience immersive gaming with 27-inch screens. Gaming monitors come in 1080p (Full High Definition), 1440p (Quad High Resolution), 2k (Ultra High Definitions), 4K and 5K resolutions. A high resolution means the monitor can display sharper images. 2k and 4K resolutions offer a wide field of view thanks to having a 21:9 aspect ratio instead of 16:9 aspect ratio that is the case with QHD and FHD monitors. High resolutions need powerful processing power. As such, you do not want to pair a 5K monitor with a GPU that is not up to the task since you may not get the stunning imagery that you should get with a 5K monitor. Monitors can have 60Hz, 144Hz, or 240Hz refresh rates measured in Hertz (Hz). Most video interfaces do not support more than 60Hz refresh rates on 5K, 4K, or UHD. It means that you don’t need to get the highest refresh rate you can find on a monitor; 144Hz is, therefore, more than enough to play the latest titles with high-end graphics cards. Monitor use IPS (In-Plane Switching), TN (Twisted Nematic), and VA (Vertical Alignment) panel technologies. The key differences between these panel types is that TN panels offer fast refresh rates, fast pixel responses, and are affordable. IPS panels have wide viewing angles, powerful gray-scale performance, an impressive color quality. For contrast, color saturation, and deep blacks, VA panels are the way to go. The shorter the response time, the smoother the images. It is the amount of time the monitor takes to change pixels from one color to the other. A long response time results in blurring of images, especially in gaming. The best monitors have only 1ms response time. These two technologies reduce tearing and stuttering of images. Manufacturers allow you to have the luxury of choice between Nvidia’s G-Sync that is used with Nvidia graphics cards and cheaper AMD’s FreeSync that you can use with low-end graphics cards. It all depends on the hardware you are using since you cannot opt for Nvidia G-Sync when you have already installed an AMD graphics card. Modern monitors offer many video inputs. For video and audio transfer, the monitor should have a DisplayPort 1.4. Dual HDMI ports are ideal for gamers who play on consoles. 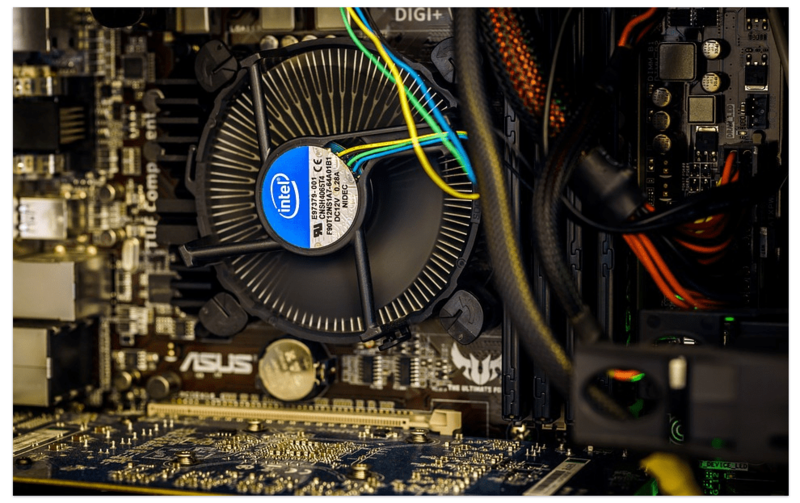 But for a custom built PC, DVI connectivity is just as important since it is what most graphics cards offer for connectivity. USB ports are an amazing feature to have in any gaming monitor. They allow you to connect gaming controllers, mice, external speakers, thumb drives, etc. If you have limited desktop space, a powerful speaker system and a built-in subwoofer are other features you need in a monitor that will give you an amazing gaming experience. The final process after choosing the components will be to install the parts. You should take your time and do your research about where each part goes. Do not forget to read the manufacturer’s instructions. After you have built your gaming PC, it is time to complete your setup by having the best peripherals. You will want to look at the best gaming mouse, gaming keyboard, gaming mat, and gaming headsets. All these are your preference as they contribute to your long term comfort and gaming Performance. 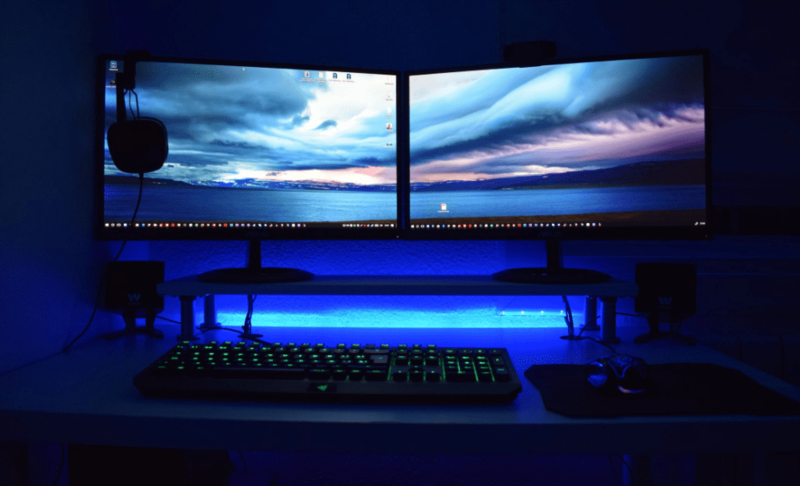 We are the end hoping we have covered as much as possible to shed light on what every beginner needs to know when choosing the different components that go into your gaming PC. Enjoy your new, personally built PC because you did it yourself! It puts you in a better place when it comes to the inevitable upgrades and troubleshooting because you are in the know about the hardware that makes up your gaming rig.